Oh god thats way too cute. 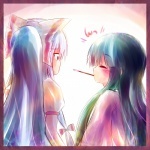 I think Mokou is actually so clueless here that she was just going after the whole Pocky stick. Now that I read it, Mokou really did go after the rest of the pocky o.O . . . Aren't misunderstandings like this just so controversial?? Awwwwww! I also lol'd when i realized she just wanted the rest of that candy. Kaguya doesn't care, she's just happy. I'm tempted to cut this image in half, leave it at Kaguya crying, and pool it for depressing. You're a horrible person and you should feel bad. I dunno, that sort of makes the "Satisfied?" a little out-of-place. And with this post I have officially developed type two Moebeetus. "This post was deleted. Reason: Unapproved in three days. MD5: 75526434d30c8b2050ea65d69c541689 "
How can you consider fail a 3 months old post?